The Last Jedi backlash will not have an impact on Rian Johnson's upcoming Star Wars trilogy. The director answered a question about the trilogy on social media, putting an end to the rumors that Lucasfilm had put his new story in "the trash." Johnson's first time directing a movie in the Star Wars universe was met with mixed reactions from fans. There is a group who stand by Rian Johnson's risk taking and another who absolutely hate it, which is where this rumor originated from. Popular Star Wars "insider" Mike Zeroh revealed a scoop earlier this week, stating that Disney and Lucasfilm were tired of the backlash that The Last Jedi had created and were shrinking Rian Johnson's trilogy into one film. Zeroh claimed that the success of the one movie would determine whether the rest of the trilogy was made or not. However, the director confirmed that Zeroh's report is fake news when a fan messaged him on Twitter asking if the trilogy was still happening. Johnson replied with a simple, "yup," adding the fist emoji. 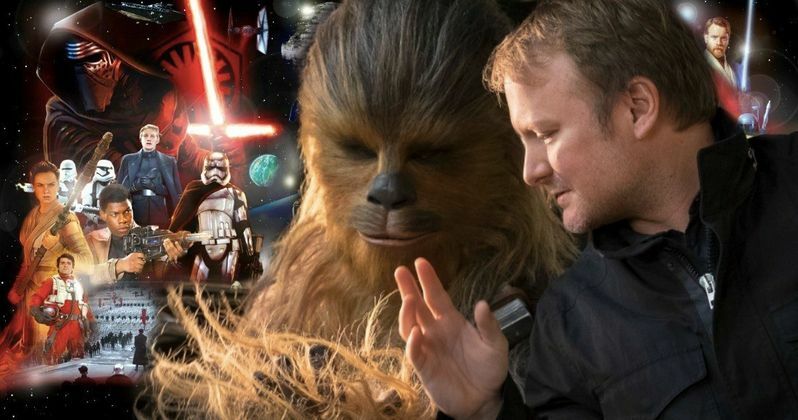 Rian Johnson's new Star Wars trilogy is currently a mystery. It will take place outside of the Skywalker storyline and it will explore new places and new characters within the universe, according to Johnson. As for specifics, there has not been any new information reported about the project, which is why the rumors of a shutdown spread so quickly. Lucasfilm and Disney have reportedly canceled the planned Obi-Wan and Boba Fett spin-off movies due to the failure of Solo: A Star Wars Story at the box office, and many have lumped Johnson's trilogy in there as well. Game of Thrones co-creators David Benioff and D.B. Weiss are developing a series of their own for the Star Wars universe, which like Rian Johnson's, has not been reported about in a while. However, it's Johnson's name and project that ends up in the news because of The Last Jedi backlash. Benioff and Weiss have yet to discuss what their films will be centered on, but they're probably really busy with the final season of Game of Thrones, which is currently in post-production, preparing for a release in the first half of 2019. Star Wars 9 is currently filming and is slated for a December 2019 release date, which means that another Star Wars project could move into production in 2019 for a possible premiere in 2020. Like the story for Rian Johnson's trilogy, the production start date is also a mystery at this time. It's unclear if Disney and Lucasfilm will want to introduce a new trilogy so quickly after wrapping up Star Wars 9. For now, we'll just have to wait patiently to see what Johnson comes up with, but at least we know that his idea has not been thrown in the trash by Lucasfilm. You can check out the fan and director online interaction below, provided by Rian Johnson's Twitter account.